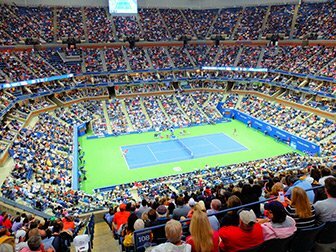 US Open Tennis tickets need to be purchased before you travel, you cannot buy them at the venue itself. US Open Tennis is one of the four Grand Slam tournaments and takes place each year in New York. This two-week tournament is the biggest sporting event in the US with the most spectators. The US Open Tennis is held during the last week of August and the first week of September. This event is a stage for the biggest names in tennis and also where the most dramatic and challenging matches take place. It is also the last Grand Slam of the year. Buy US Open Tennis tickets now and pay no service fee and get free shipping (e-tickets) or choose free local pick-up! You can buy tickets to a match or a session at US Open Tennis by looking for the date when you’d like to visit a match or view the table below. The tickets can be paid by credit card and are sent to your address or email. You can also pick up the tickets in New York for free. If you can’t print out your e-tickets, you can also drop by the office. The office is centrally located, near Times Square. Picking e-tickets is the fastest option and local pick-up is the best option for all other tickets. Both options save shipping costs, so I would highly recommend either option. Your tickets are 100% guaranteed authentic and delivered on time. 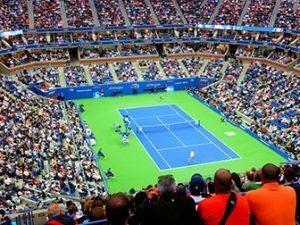 Which US Open Tennis Session to Attend? Since the tournament is two consecutive weeks long, you should consider which days you want to attend. Tickets for the beginning rounds of the US Open Tennis are cheaper than at the end of the tournament (the Championships). Day tennis matches cost more, because there are more tennis matches to watch: Day sessions last from 11:00 until the matches are completed (usually in the evening). The evening sessions begin at 19:00 and only last a few matches. Finally, there are three types of tickets: Arthur Ashe, Louis Armstrong, and General Admission (Grounds Pass). If you buy a ticket for the Arthur Ashe Stadium, you get a designated seat at centre court. This is where you will find the top matches in tennis. So if you want to see the top tennis stars and the celebrities that watch court-side, then you must buy tickets for Arthur Ashe. 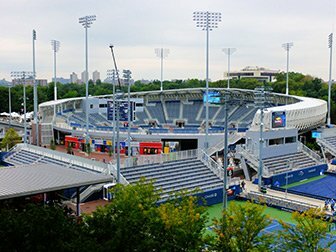 Additionally, an Ashe Stadium ticket will give you access to other tennis courts at the US Open, including the Louis Armstrong, the Grandstand, and the eighteen outdoor courts. 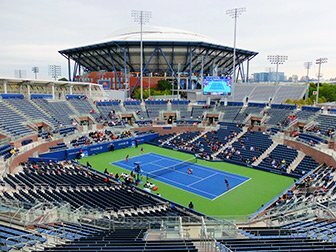 In addition to the Arthur Ashe Stadium, there is another main stadium, Louis Armstrong, but this is a smaller stadium where secondary matches are played. You can buy a ticket for an assigned seat court-side. Court-side at Armstrong will be much better seats than the ones at Ashe. However, an Armstrong ticket will not give you entry to the Arthur Ashe Stadium. An Armstrong ticket will provide you an assigned seat in Armstrong, access to the Grandstand (the third and smallest stadium of the show courts), and the eighteen outside courts. If you decide not to spend the money for the more expensive tickets for Arthur Ashe or Louis Armstrong, then you can purchase a General Admission pass. This is only available for day sessions. With this ticket, you can visit the Armstrong Stadium (top rows only), Grandstand, and all eighteen outside courts. In addition, there is a jumbo TV screen on the grounds where you can follow the matches played in the Arthur Ashe Stadium live. 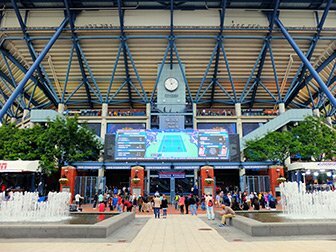 Since most of the tennis matches in Ashe are the American players or the top tennis players, the chances are great that you will easily be able to watch Andy Murray, Novak Djokovic, or Rafael Nadal on one of the outside courts. Take subway line 7 that leaves from Times Square and Grand Central Station to the stop Mets Stadium – Willets Point. When you get out it will be clearly marked how to walk to the stadium. You can use the MetroCard which means that the trip will only cost you $2.75. How to get Back to New York? The best way to get back to Manhattan is the 7 subway line. The subway is safe at night as well, because you won’t be the only tennis fan heading ‘home’. There are also taxis available but that will cost you up to $60. If you want something to eat or drink, there are plenty of choices all day — from morning until night! There is something for everyone: sandwiches, ice cream, hamburgers, pizza, coffee, cocktails, beer, wine, and much more. In addition to the food court and food stands located throughout the grounds, there are several restaurants. There is a Brazilian restaurant called Mojitos and they have the best terrace for people watching as the fans and even players walk by. However, it’s not cheap and the food and drinks there are pricey. A simple sandwich and non-alcoholic drink can cost you about $20. What can you Take with you to the Stadium? When going to the US Open Tennis, leave your large backpacks, laptops, large bags, video recorders, and cigarettes in your hotel room. You cannot smoke anywhere on the grounds at the US Open. Cameras are permitted, but food and drinks from outside are not allowed. You will be checked by security before entering the US Open. Eric’s Tip: If you decide to buy a General Admissions pass (Grounds pass), then any one of the days during the first week of the tournament are the best to attend. This is because even during the early rounds, the majority of the top matches in singles can be viewed on the outside courts. However, during the second week, the singles matches will mainly be played on one of the main courts while the outside courts are showcasing doubles, juniors, and wheelchair matches.